Does my ladder need a handrail? Almost all ladders will have an extension at the top, with the only exceptions being ladders accessing roof hatches, manholes, floor doors, or anything else that closes over the top of the ladder. If you are exiting the ladder to the side or going to an offset platform due to the 30’ maximum climbing distance between ladders, you will need to add four more rungs above the platform. Those rungs are only to be used for hand-hold only, to give you something to grab onto to safely exit the ladder. If the ladder is going up to a wall, to a roof, or to a mezzanine, then you will need extensions on the ladder for the “walk-through” exit of the ladder. 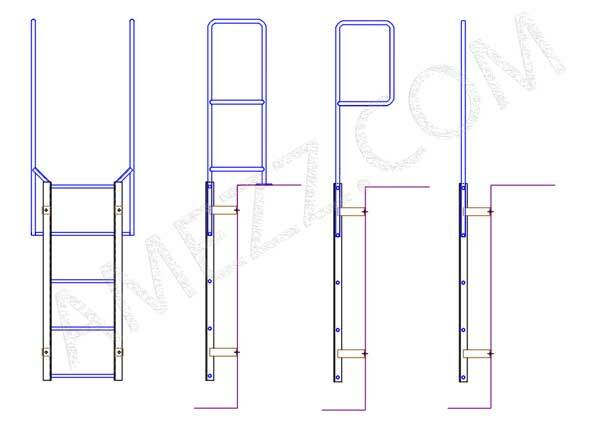 We have three different designs of walk-through handrails and I’ll go into the details on each of them below. The first design, the “8” shape, is our standard ladder design. This is the most commonly used handrail setup as it allows for the top of the walk-through to mount to the landing surface, providing the greatest rigidity at the handrail. It also makes installation easy, as there are no questions where the top rung mounts; it is always installed properly meeting the top of the landing surface as required by code. In cases of short parapets or locations where you cannot have the walk-through handrail anchor to or even set upon the roof you would use the second “P” profile, our “self supported walk-through handrail”. This handrail design works well when there is a parapet under 14” high that the handrail mounting pads would not line up with. It is not a necessity to use the “P” shaped handrail in those instances. Many installers still prefer the “8” layout for the added cross brace back to the ladder. When installing a ladder with our self-supported walk-through handrail, be sure to install properly, with the top rung level with the top of your roof. There is no foot pad at the top to ensure this is done, so installation just requires a check to be sure of compliance. 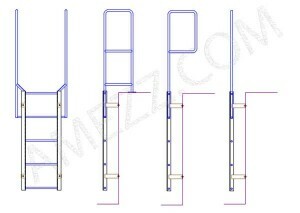 The last ladder handrail design is our “customer supplied walk-through handrail”. 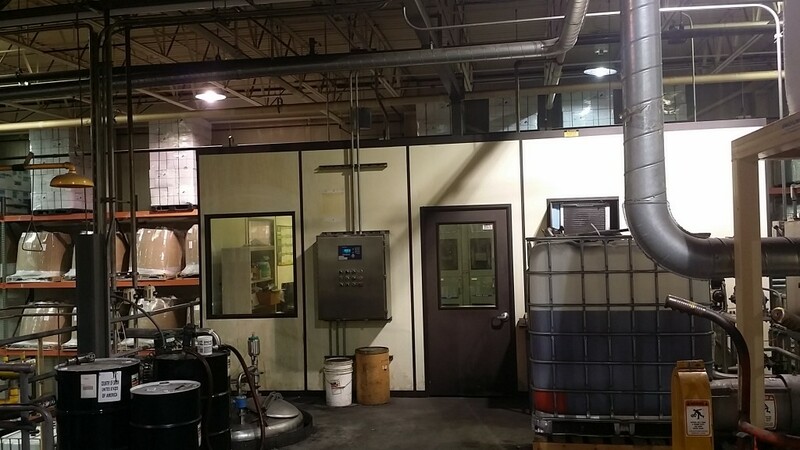 This is used in instances where the installation location has existing railing and handrails that they want to weld the walk-through handrail to. This is useful in locations where space is minimal and existing site conditions allow for field welding to existing rails. Not shown is our step across platform, which is essentially a crossover used when site conditions require the ladder rung to be more than 12” away from the landing surface as required by OSHA standards. Most commonly, this is used on locations with gutters that are more than 5” off the face of the climbing side of the wall. “Ladder extensions.” The side rails of through or side-step ladder extensions shall extend 3 1/2 feet above parapets and landings. For through ladder extensions, the rungs shall be omitted from the extension and shall have not less than 18 nor more than 24 inches clearance between rails. For side-step or offset fixed ladder sections, at landings, the side rails and rungs shall be carried to the next regular rung beyond or above the 3 1/2 feet minimum (fig. D-10). This entry was posted in ladders and tagged custom fabrications, Handrails, ladder, OSHA on February 3, 2016 by Brett.